Considered as one of the most prized cuts, pork belly is tender, succulent, and a perennial favorite. A marriage of Filipino and Thai cuisine, this dish is a play on textures and flavors. 1. Make the lechon kawali: Place water in a large pot until half full. Add salt, peppercorns, garlic, and bay leaves; bring to a boil. Add pork, lower heat to simmer, and cook until tender, about 35 minutes. 2. Drain pork. Leave on a wire rack until completely dry; cover with plastic wrap. Freeze until fat is frozen, about 5 hours. 3. Make the red curry sauce: Blanch potatoes, carrots, and sweet potatoes in boiling salted water for 5 to 8 minutes or until half-cooked; drain. Set aside. 4. Heat 3 tablespoons coconut milk in a wok over medium-low heat. Add red curry; cook until bubbling (be careful not to burn mixture). Add remaining coconut milk; mix well. Add vegetables and shallots. Simmer until tender. Season with salt and sugar. 5. Heat oil in a deep, heavy-bottomed pot. Deep-fry frozen pork belly until golden brown and crispy. Chop pork into 2-inch pieces. 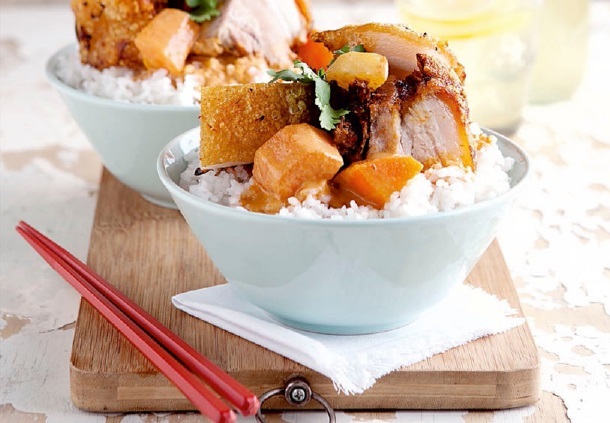 Place red curry sauce in a serving bowl; top with lechon kawali. Garnish with cilantro leaves. Serve with steamed rice.